Provide the capability to share articles from your web site. Great for search engine rankings. Yes, that's right, the "Ultimate Upgrade"! Currently Shipping Preloaded with Over 70 Professional Articles! Stoco Software Design, creator of the highly regarded and successful Digital Vault, introduces his next "Power Plug-In" for your site.. Installed And Running In Under 15 Minutes! Charge your site with the plug-in which comes preloaded with Over 70 professionally written articles! Yes, the Article Xchange is ready to go "out of the box" with a an impressive collection of professional articles, some of which are from the current leaders in Internet marketing! The easy to use interface allows you and your visitors to upload and download new articles at any time, enabling you to keep an ever updating collection. A collection which is fully searchable, by author or keyword! Imagine having a database that you personally hand picked the articles for, which are rich in keywords that apply to your site. Wouldn't the search engines love your site just a bit more? Of course they would! The Article Xchange will have people coming to your site to place their articles in your database, again and again, building your site content for free! It doesn't get much sweeter than that! The index page updates automatically when a new article is loaded into the system. And as an additional benefit, it is a real HTML page and not just a search result, making it search engine friendly. With a few minor changes, the Article Xchange will match any site. You need only edit two files. How's that for simplicity? What else can you use the Article Xchange for? Have an ezine? Then use the Article Xchange to easily archive your issues, and give your visitors the ability to search your issues for any topic! Use the Xchange as a feature in a paid or free membership site. The article database is an incredible tool which will enhance the value of any site.. free or paid! Creative writing sites are popping up all over the web. The Article Xchange is an ideal solution for story submissions, and it's completely on auto pilot. Let members submit their own works! Online public diaries are becoming more popular, and for this task, the Article Xchange is second to none! You see, as I said before, its uses are limited only by your needs and imagination. Now, let's talk a little more about what makes the Article Xchange such an incredible tool for your online arsenal. Our Search Engine is so powerful, it will search thousands of articles in seconds. Your readers can find the perfect article by simply entering a few key words. Of course, the results are ranked in order of strength of the match. The index page provides a listing of the 25 most current articles. All articles are in order of date posted. This simple index provides a link to the article, the name of the author and the date the content was posted to the site. When a new article is loaded into the system, the index page updates automatically. And as an additional benefit, it's a real HTML page and not just a search result, making it search engine friendly. Articles chosen for preview open in a new window, so your visitor never loses their place in the article listings. The Article Xchange also allows for multiple windows to display as many articles simultaneously as the reader wants and needs. Includes A Detailed Installation and Usage Guide! 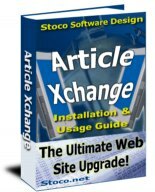 The Article Xchange comes complete with a detailed but easy to understand installation and usage guide! You won't be left out in the cold trying to figure out how to use the Article Xchange, we've seen to that. A plain english and detailed guide will get you started quickly. Worried about your servers ability to run the software? Don't! This software installs in minutes and requires nothing special. Only a CGI-BIN and Perl. No database, and no programming experience is needed. You won't have the hassle of setting up a database, as MYSQL is NOT required for the Article Xchange! You also don't need to be a programmer to customize it to match your site. Setup is a snap! This is one of the easiest installations you will ever perform. It should take no more than 15 minutes from start to finish on the installation. 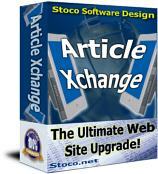 You simply will not find a better 'Power Plug-In" for your site than the Article Xchange. It's power, versatility and affordability makes it a MUST HAVE for any serious online marketer. You will be invited to join our top notch Affiliate Program. How is my order filled? Once your order has been accepted, you will be prompted to download your purchase. We guarantee that this software will perform to your satisfaction within 30 days or your money back. No questions asked.